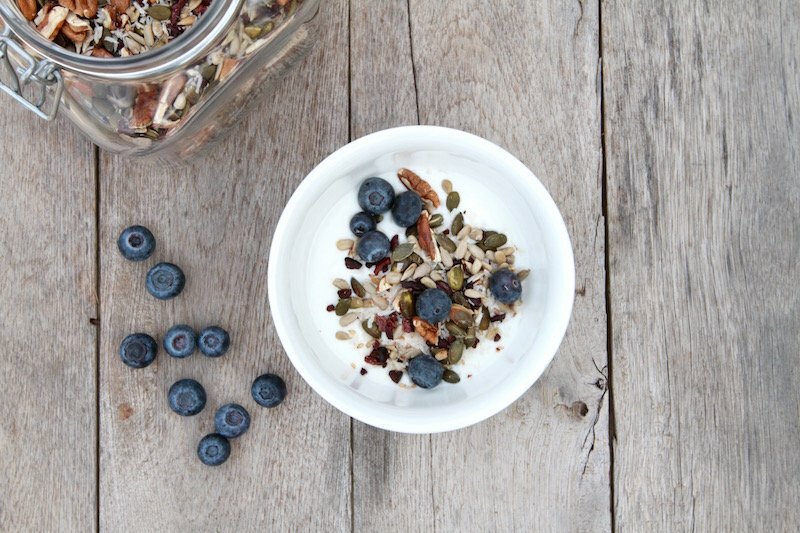 Natural unsweetened yogurt with homemade muesli. If you are in the first month of your candida diet then I will regiment you to have kefir instead. First roast the pecan nuts and sunflower seeds for a few minutes in a medium size pan on medium heat. You don’t need any oil. Take them of the heat and place them in a bowl, after roast the pumpkin seeds in the same pan for a few minutes and after pour them into bowl with the pecan nuts and sunflower seeds. It’s important that non of the nut and seeds get’s burned. Then add the rest of the ingredients and store the muesli in a dry place. You should avoid blueberries for the first three month if you are on a strict Candida diet since they are high in sugar and can feed the fungus. But you can have a few cranberries instead, they are low in sugar.